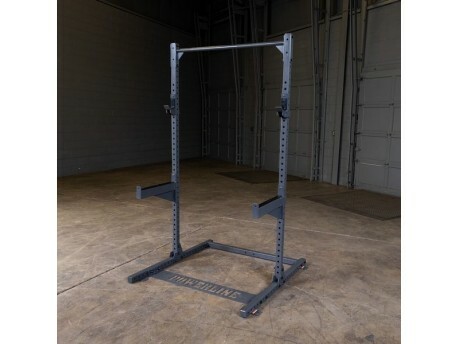 A half rack version of Body Solid's Powerline PPR1000 Power Rack. 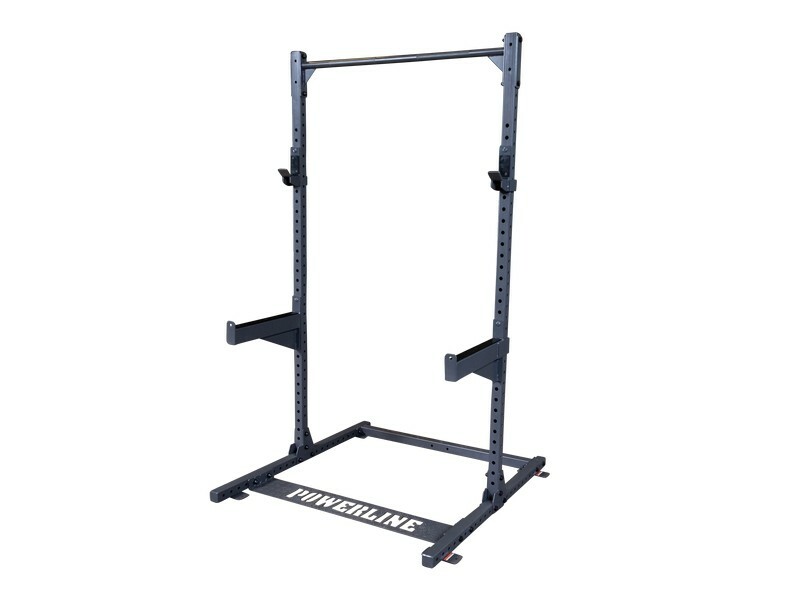 The flattened lower cross brace eliminates the problem of the lower cross brace getting in the way of your weight bench. Place the bench wherever you want. Normally you would have to get a rack with no lower cross braces, forcing you to bolt it to the floor for stability. Body Solid has figured out a way to solve the problem without requiring you to bolt it down. Extra J-Cups - The base unit includes one pair. Add another pair o install at another position to avoid having to move them around, such as on the outside of your rack at shoulder height for standing military presses and other exercises that you might want to perform from of the front of the rack instead of inside. One pair. Lat Attachment - Includes lat bar. Also includes lower pulley and a short straight bar for doing rows, curls, and other exercises. You can add additional cable attachments such as an ankle cuff or tricep rope. The lat attachment is.84" high when attached. 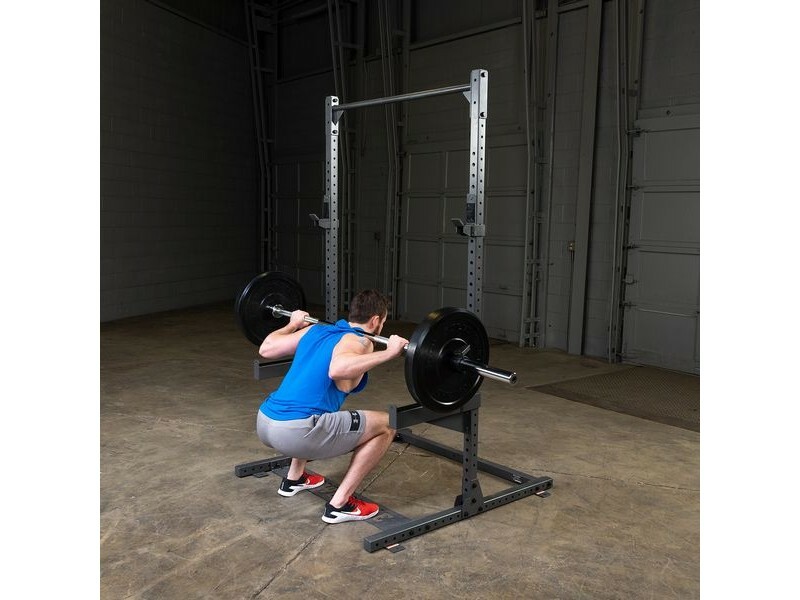 The plate-load carriage features 1" diameter weight posts that will accommodate standard or olympic plates. Buy olympic adapter sleeves to fit olympic plates snugly. Rear Rack Extension - Provides extra space for weight storage pegs and for a battle rope anchors. 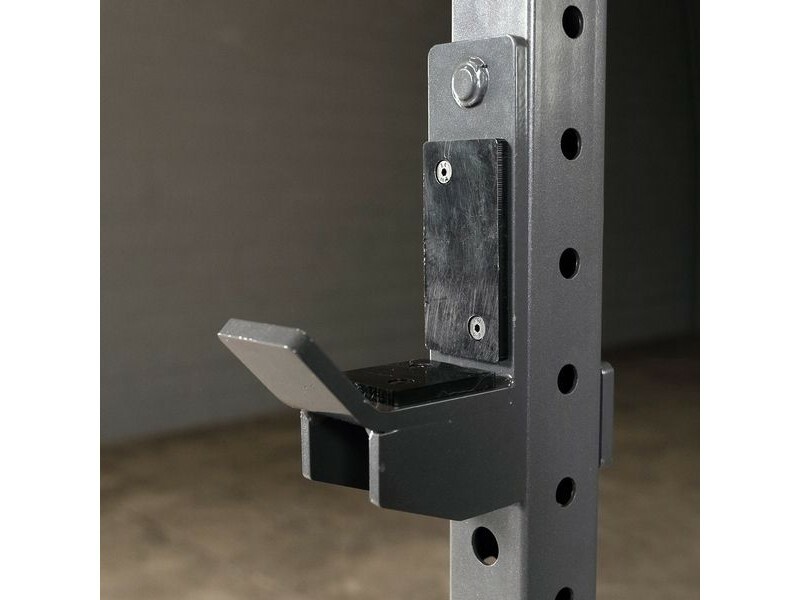 Weight Pegs - Attach several of these to the Rear Extension to store all your plates, out of the way of your barbell's range of motion in the rack. Battle Rope Anchor - Slip your battle rope through this perfect attachment point that will prevent wear and prevent the rope from catching on anything. Landmine Base Attachment - With a 7ft bar and plates, do a variety of landmine rotational training exercises. Multi Grip Chin Up Bar - Put your hands in a variety of positions and widths to change up your workout or reduce stress on your joints. Band Pegs - Attach to the bottom of the rack and use resistance bands to loop over your barbell. These add more resistance to the upper portion of the lift.